Secondary bone cancer. 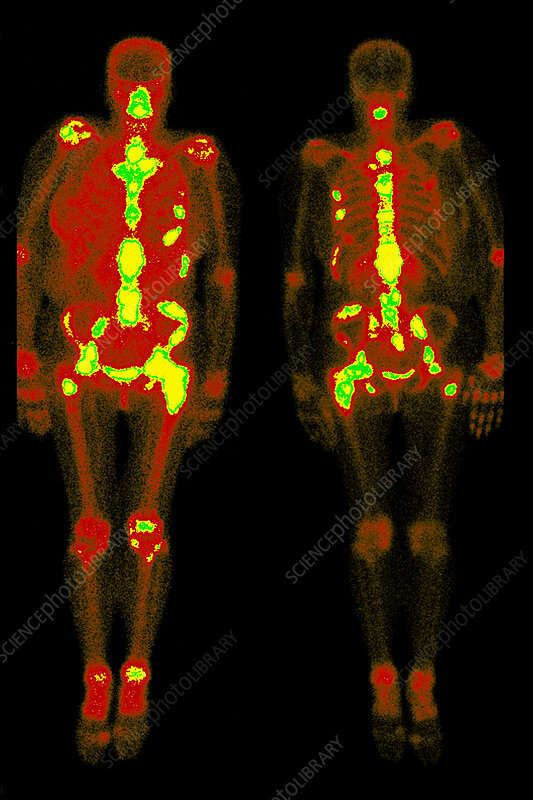 Coloured gamma scans of the skeleton of a 57-year-old woman with secondary bone cancer (green and yellow areas). The primary cancer is of the breast. The skeleton is seen from the front (left) and from behind (right). The cancer has spread to the spine, skull, pelvis, ribs, shoulders, hips and knees. Cancer that spreads from its original site is referred to as secondary cancer, and the cancer is said to have metastasised. The prognosis is poor. A gamma scan (also called a scintigram) is obtained by injecting a radioactive isotope (here Tc-99m, or Technetium-99m). This tracer material becomes concentrated in the cancerous tissues and is detected by the gamma radiation it emits.